The four-week Ontario Municipal Board (OMB) hearing concerning the application to development the Fraser Property at Burleigh Falls on Stony Lake begins on Tuesday, September 13, 2016 at the Wilson Park Community Centre, Northey’s Bay Road, Woodview, ON. FFW is committed to securing a healthy future for the Fraser Wetlands – for all our sakes! We’ll be at the Hearing, along with our lawyers, Donnelly Law, and a number of expert witnesses who’ve had time to assess the property. During the Hearing, a strong show of community support will be essential. If you’re available, please consider attending! The 2014 Provincial Policy Statement (PPS) states that no development should take place with 120 metres of a Provincially Significant Wetland (PSW) – unless it is proved that the development will not affect the wetland in any way. Ninety per cent (90 %!) 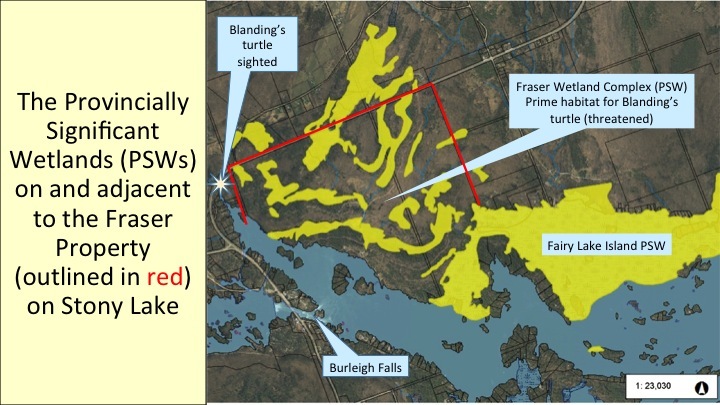 of the Fraser Property is WITHIN 120 metres of the Fraser Wetland Complex (PSW) or the Fairy Lake Island PSW. You can read the OMB decisions from the two Prehearing Conferences in 2015 here: https://www.omb.gov.on.ca/english/eStatus/eStatus.html (click “N” for North Kawartha). The definitions below clarify choices for us all. Thanks to Roz Moore of the Environment Council for Clear, Ston(e)y and White Lakes for sending this to us. Follow the procedures set out in a procedural order from a prehearing – the prehearing meeting has now been scheduled for Monday, August 31st, 11 a.m., North Kawartha Community Centre. These procedures may set out when to appear at a hearing and when to provide participant statements to the parties.